We're a little over-excited about this one. Need to breathe. Need to calm down. Photorealism: 50 Years Of Hyperrealistic Painting arrives in Birmingham Museum and Art Gallery's Gas Hall, this week, and it's mesmerising. It's the largest retrospective in Europe devoted to Photorealism, a movement that has its roots in the US and stuck two fingers up at abstract expressionism. 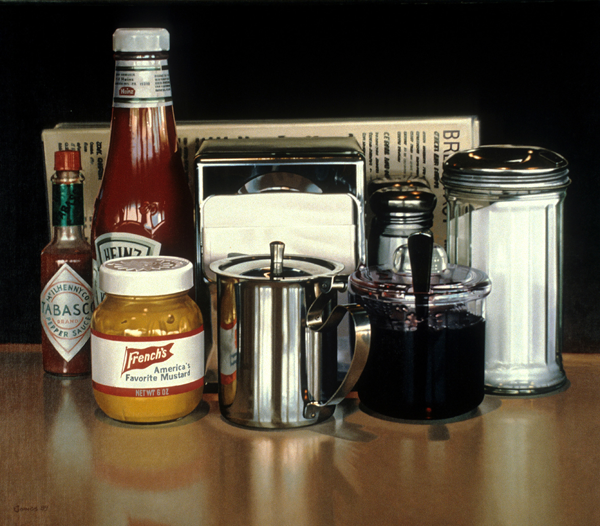 The top painting is by Ralph Goings recognised as one of the original members of the Hyperrealist group. "In 1963," he said "I decided I wasn't going to do abstract pictures. I decided I should go as far to the opposite as I could. Projecting and tracing the photograph instead of copying it freehand would be shocking. To copy a photograph literally was considered a bad thing. It went against all of my training. Some people were upset and said 'it can't possibly be art'. That gave me encouragement. I was delighted to be doing something that was upsetting people." 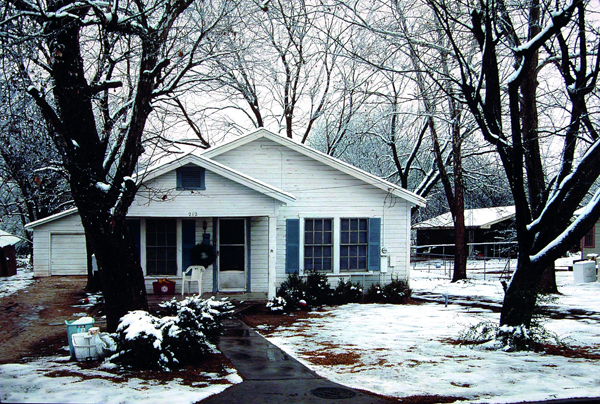 This stunning piece is by Rod Penner who depicts homes and streets in small Texan towns. His paintings never show people but the inclusion of their belongings remind us they are missing, for example the plastic chair in this painting of house number 212. Penner paints with such precision and detail that it is difficult to distinguish his paintings from their source material. 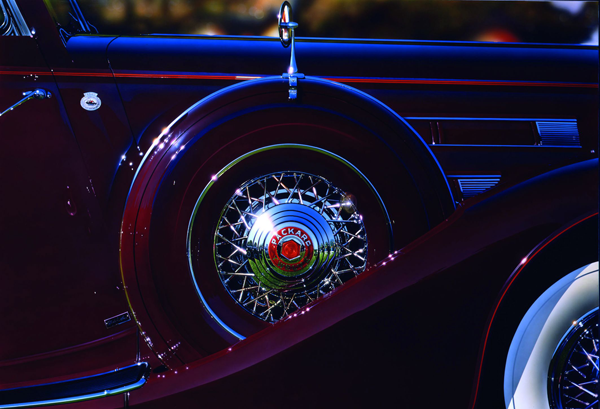 Peter Maier is one of many Photorealists who are obsessed with cars. He focuses on their surfaces and reflections, often in close-up and paying particular attention to specific parts. Before becoming an artist Maier was a senior designer for Cadillac, Pontiac and Chevrolet. He uses a specialised car paint which he applies with a spray gun to aluminium sheets in up to 25 layers. This gives his paintings the surface of highly polished car bodies, a three dimensional character and a deceptively real appearance. They're bizarre to look at. Up close they're obviously paintings, but step back three paces and your brain convinces you they're photos. Chuck Close rose to fame as a Photorealist known for his large-scale portraits and has made the human head his subject matter. Close uses a grid system to transfer photographic images to canvas. 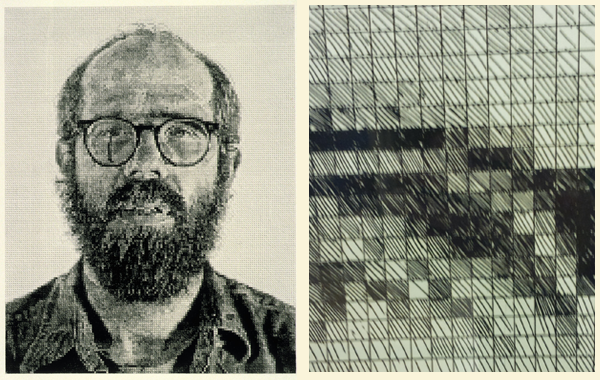 Above left is a self portrait while above right is a close up of the top rim of his glasses, which shows his use of grids, filled with lines. Once you're 15 or so yards away, mark our words, it looks like a photo. So, yeah. We're a bit in love with this exhibition. You can see a gallery of images, all of which are on display, on our Facebook page. But what you really need to be doing is getting to BMAG between November 30 and March 30. It costs £6.50 and is worth every penny. More details here. OH, YOU'VE NEVER HEARD OF A MARTINI CLUB SANDWICH? You probably should. 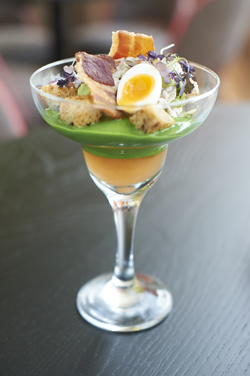 It's served at The Balcony (£9), a new brasserie and champagne bar in Selfridges. It's their signature dish and consists of tomato jelly, lettuce puree, soft boiled quail egg, crispy pancetta, confit chicken mayo, avocado puree and croutons. Other menu highlights include chorizo hash browns (£10) and southern fried chicken on waffles (£12). Owned by Searcys, the people behind the new Centenary Bar at The REP and the Champagne bar at St Pancras International, it's a must visit. Check out their menus here.